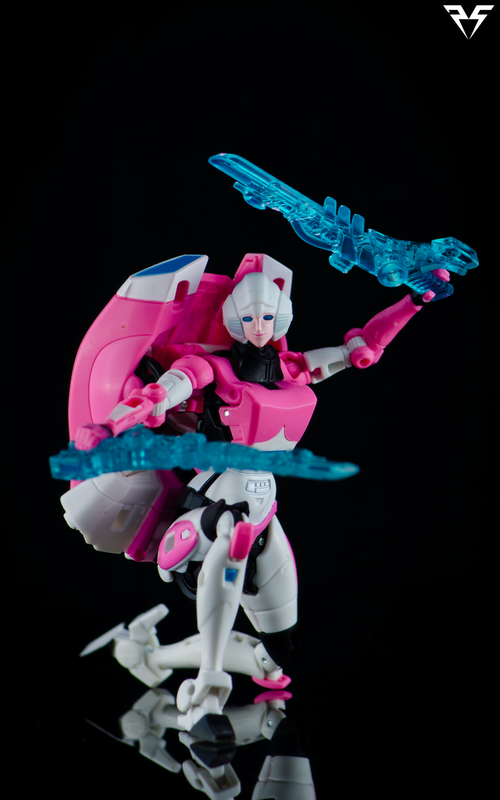 It's been 30 years and we finally have a legitimate G1 inspired transforming Arcee figure coming at us thanks to the Hasbro Generations IDW line. 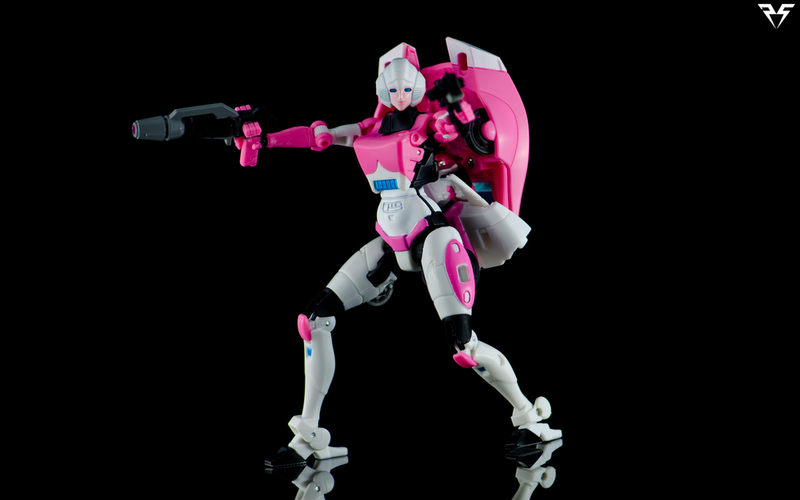 Arcee is fully realized in molded Pink, White and Black plastic with Grey and Blue paint apps. She looks really crisp thanks to most of her colors being molded and the tampograph Autobot logo on her hood looks great. 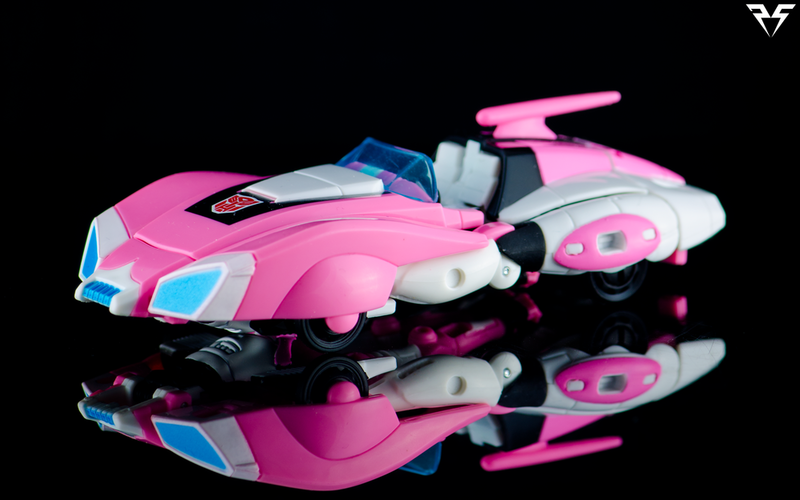 Her transformation is simple but satisfying and results in a fantastic looking Alt mode. Her bot mode does suffer slightly with a large amount of back kibble, but her posability is hardly hampered despite the large "backpack". There are 2 variations on the mold. The first featured hands that were fully enclosed, the revision (which mine is part of) has opened hands. The opened hands have a small lip on the bottom of the palm that prevents the guns from being placed all the way in to her hands without modification. You can sometimes wiggle the gun past the lip but it may cause damage to your figure so I don't recommend it. There are no wrist swivels but there is a bicep swivel that can help out for more dynamic poses. She comes with 4 weapons in total. A small black and grey pistol that resembles her weapon from Transformers: The Movie. She also has a larger pink, black and grey pistol that kind of looks like her comic book weapon and finally 2 translucent blue energy swords. The swords are an homage to her animated persona as well as the IDW comics. She has tab in points on her thighs that allow any of the weapons to be plugged in, though, the guns looks best there in my opinion. Her swords can be tabbed in to her wrists to give her a sort of punching dagger or an arm blade look similar to Transformers Prime Arcee's blades. I wish there was a way to have her swords either plug-in to her back or slide in to the front fenders of the car for storage. Generally I end up leaving them to the side. In vehicle mode both her pistols can be stored on the underside of the vehicle, while the swords can be tabbed to the sides or top of the rear fenders. You can also peg the swords in to the underside of her front fenders for a weird "stabby" car mode similar to Transformers Prime Wheeljack. She can not roll with the swords attached underneath, much like the bot mode I feel a more concealed storage space for the swords would be nice. In my opinion the swords feel like an add-on to an already completed toy and as such I've come to forgive their lack of storage. 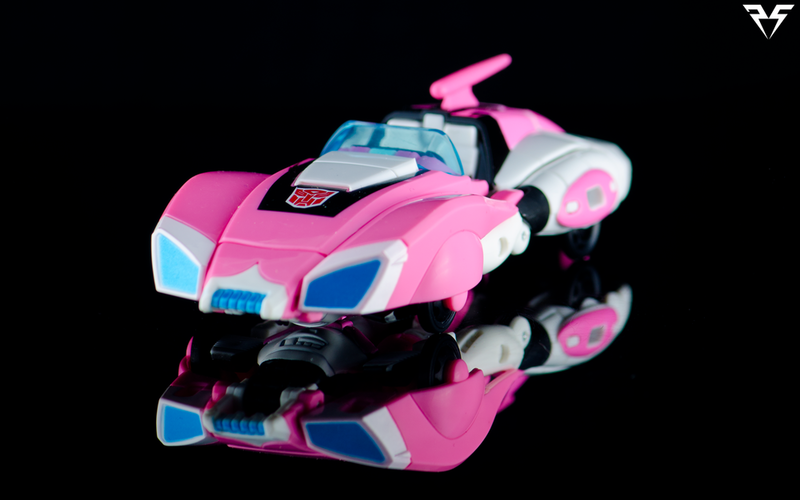 Fans have been waiting since the release of Transformers: The Movie, for an official representation of the quintessential G1 Fembot and now that we have her I am as happy as can be! 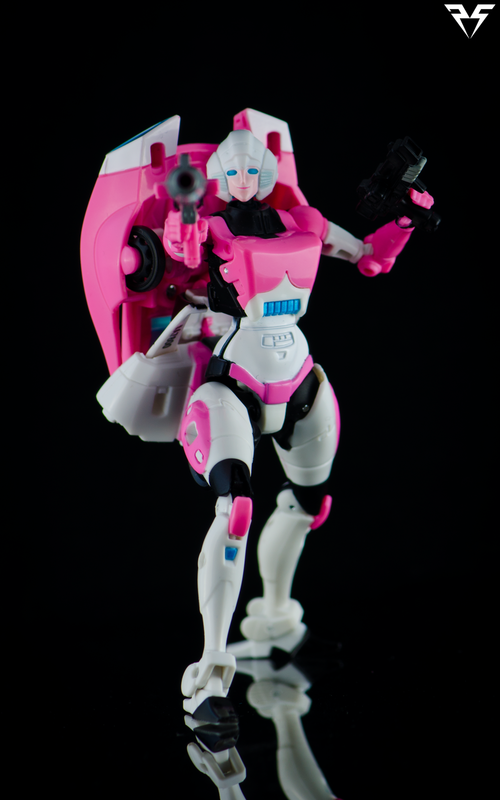 She is a great representation of Arcee and a wonderful addition to any Classics/Generations collection. If you want something with more posability or with a little more complexity, there are some third-party options like MMC Azalea. 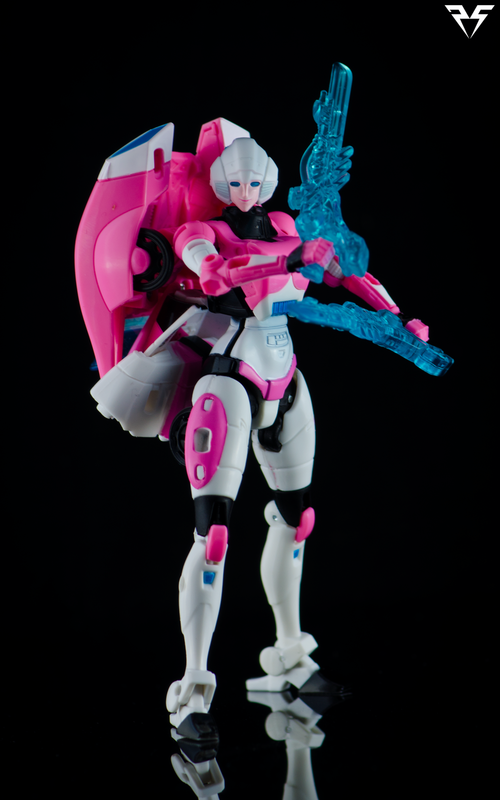 For those on a tighter budget or with a hunger for official merchandise she definitely fits the bill as a G1 or Generations Arcee. Check out more shots in the Gallery below!